UPDATE: Who Likes Wet Paint Smell? 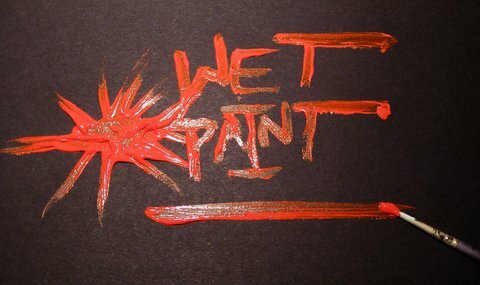 The odor of wet paint can be irritating, especially to those with allergies or asthma. The paint is “off-gassing,” which means it is releasing molecules of gases that were in the paint as it dries. But we learned this week that it can actually be more dangerous than that. Researchers from Harvard Center for Population and Development Studies looked at over 2000 chemical plant workers in France who had worked with solvents used in paint, adhesives, degreasers and glues. They found that even if the exposure to the solvents had occurred decades before the study, it still could affect cognitive ability. Decades later. In recent years, workers in chemical industries have been much better protected than those of years gone by, wearing respirators and in safer facilities, but when we paint our homes, we aren't wearing safety equipment whenever we can smell the paint drying. Those molecules are there in our indoor environment, and not just from paint, but also varnish on your new dining room table and the adhesive holding down that new carpeting. So, that said, we hope you have used interior paint! In researching for this story, I read some posts about people using exterior paint indoors and the fumes basically never went away at all. They had to paint over the walls again with a sealant used by fire restoration folks to get rid of smoke smell. Is it safe to be in the room when the paint smell is still present? Yes, but some people may have allergic reactions to it and people with asthma may find that it is a trigger. Even if you are not super-sensitive, it is an irritant and may keep you from sleeping well until it has dissipated. How can you get rid of the new paint smell? Open the windows! Wide! And the doors! Air that room out--and good! How long will it take? Unfortunately, left to its own devices, it is hard to predict as there are factors like: how smelly was it at the beginning (some paints smell more than others) and the humidity while you are waiting. At Alliance Environmental Group, we use ThermaPureHeat to get rid of new paint smell, and also other irritating odors that can come from mold, mildew, organic contaminants, new carpeting and building materials and even mystery odors! Recently, we used ThermaPureHeat in a home in Moorpark that needed that new paint smell gone ASAP! We increased the interior temperature of the home for 3 days, 24/7, and got rid of the paint smell incredibly quickly. We bring in our ThermaPureHeat trailer which is similar to a water heater. The trailer heats water and transfers it to hoses into the house. Inside the house we use heat exchangers and radiators with fans to disperse the heat throughout the building. We kept the system running for 72 hours and when we were done, no more smell! It’s really amazing all the things that high temperatures can do to make our indoor environments cleaner, healthier and safer! Don’t sit there watching the paint dry, make it dry faster!